Laparoscopic Roux-en-Y gastric bypass (LRYGB) has become the gold standard for surgical weight loss. The success of LRYGB may be measured by excess body mass index loss (%EBMIL) over 25 kg/m2, which is partially determined by multiple patient factors. In this study, artificial neural network (ANN) modeling was used to derive a reasonable estimate of expected postoperative weight loss using only known preoperative patient variables. Additionally, ANN modeling allowed for the discriminant prediction of achievement of benchmark 50 % EBMIL at 1 year postoperatively. 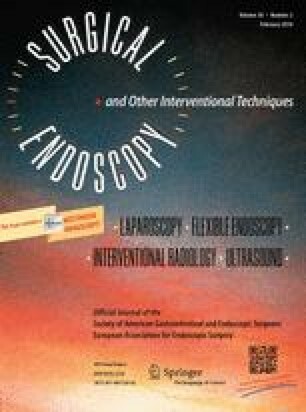 Six hundred and forty-seven LRYGB included patients were retrospectively reviewed for preoperative factors independently associated with EBMIL at 180 and 365 days postoperatively (EBMIL180 and EBMIL365, respectively). Previously validated factors were selectively analyzed, including age; race; gender; preoperative BMI (BMI0); hemoglobin; and diagnoses of hypertension (HTN), diabetes mellitus (DM), and depression or anxiety disorder. Variables significant upon multivariate analysis (P < .05) were modeled by “traditional” multiple linear regression and an ANN, to predict %EBMIL180 and %EBMIL365. The mean EBMIL180 and EBMIL365 were 56.4 ± 16.5 % and 73.5 ± 21.5 %, corresponding to total body weight losses of 25.7 ± 5.9 % and 33.6 ± 8.0 %, respectively. Upon multivariate analysis, independent factors associated with EBMIL180 included black race (B = −6.3 %, P < .001), BMI0 (B = −1.1 %/unit BMI, P < .001), and DM (B = −3.2 %, P < .004). For EBMIL365, independently associated factors were female gender (B = 6.4 %, P < .001), black race (B = −6.7 %, P < .001), BMI0 (B = −1.2 %/unit BMI, P < .001), HTN (B = −3.7 %, P = .03), and DM (B = −6.0 %, P < .001). Pearson r 2 values for the multiple linear regression and ANN models were 0.38 (EBMIL180) and 0.35 (EBMIL365), and 0.42 (EBMIL180) and 0.38 (EBMIL365), respectively. ANN prediction of benchmark 50 % EBMIL at 365 days generated an area under the curve of 0.78 ± 0.03 in the training set (n = 518) and 0.83 ± 0.04 (n = 129) in the validation set. Available at https://redcap.vanderbilt.edu/surveys/?s=3HCR43AKXR, this or other ANN models may be used to provide an optimized estimate of postoperative EBMIL following LRYGB. This manuscript was presented as a poster (Abstract ID 61988) at the Annual Meeting of the Society of American Gastrointestinal and Endoscopic Surgeons (SAGES), April 15–18, Nashville TN. Dr. Colleen Brophy, M.D., Professor of Surgery, Vanderbilt University, Vanderbilt University Department of Biostatistics, Vanderbilt RedCAP: CTSA Award UL1 TR000445 from NCATS/NIH. Eric Wise, Kyle Hocking and Stephen Kavic have no conflict of interest to disclose.